No, I’m not talking about subscribing to a humanoid robot blog (like this one). 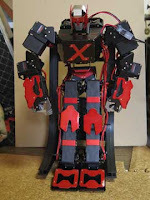 I’m talking about a subscription that gets you, week by week, all the parts and instructions to build a complete, modern, humanoid hobby robot from the ground up. 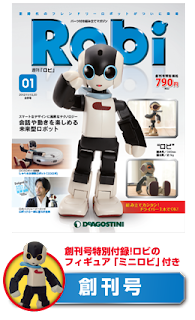 Each issue includes a magazine with articles, pictures, and instructions, as well as some robot parts. After 70 issues, you have all the parts and, if you’ve been following along the whole time, your RoboOne-suitable robot is complete. This innovation comes (not surprisingly) in Japan, and has been done twice so far, both by magazine publisher DeAgostini. The first one, “Weekly ROBO XERO,” began in February of 2011, and ran through June 2012. It provided an impressive, fighting-style humanoid with 24 degrees of freedom, including working hand grippers. The robot stands 300 mm tall, and masses 900 g, making it suitable for under-1-kg robot competitions. Both ROBO XERO and Robi are based on Futaba servos and Vstone electronics. The magazines are actually sold individually (my hook about “subscribing” above may have been stretching it a bit), and prices vary from issue to issue. The first issue gets you started for 790 yen (about ten bucks), while the issue with the control board — probably the most expensive one — sets you back 1990 yen ($25). Now for the editorializing: I absolutely love this idea. It’s what we in technical circles sometimes describe as “freakin’ brilliant.” What are the two biggest obstacles preventing people from getting into humanoid robotics? Simple: (1) time, and (2) money (with the proper order of these varying a bit depending on what stage in life you’re currently in). It’s hard to plunk down $1K-$2K all at once, and commit to six weeks of evenings carefully assembling and programming the thing to do something interesting. But this weekly, pay-as-you-go approach spreads out both the time and the money into bite-sized, easily swallowed chunks. Ten bucks here, twenty bucks there? Probably half an hour, at most, to integrate the new parts with the old one? Many people spend more time and money than that at the coffee shop each week. On top of that, you get the shared experience of building a robot with thousands of other subscribers. There would surely be forums where you can discuss any problems you run into with others doing the same step, or just share your excitement. Old-fashioned readers could even write in with their comments to the magazine, which (with a weekly publishing schedule like this) could appear only a few weeks later. When you’re done, you have not only a high-end working humanoid, but a handsome shelf of glossy issues documenting your shared experience. And I’m sure that community of builders doesn’t just vaporize after the 70th installment; it would form a lasting community of friends, that would continue to support each other in taking the bot from Level 2 to Levels 3, 4, and 5. The only hitch? These magazine/robots are only available in Japan, of course. So there’s the business opportunity. The U.S. has nearly three times the population of Japan. We have hobby stores and hundreds of different hobby magazines, providing a distribution channel. The only thing we lack, I think, is the vision. Who will be the company or entrepreneur to bring this great idea to the American market?